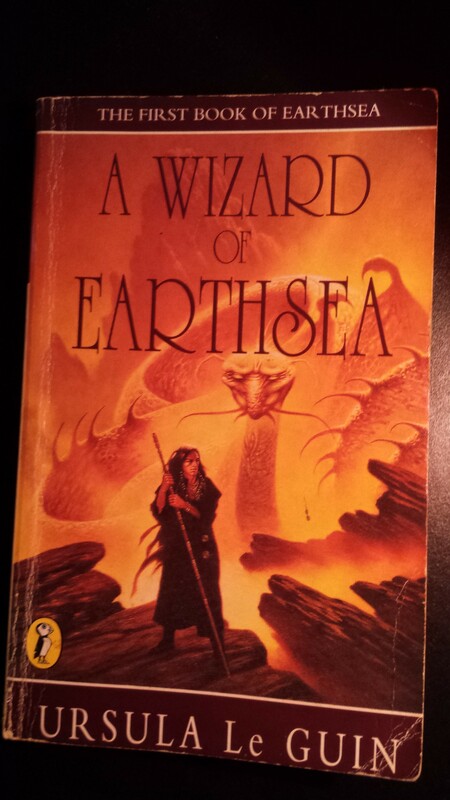 At the climax of Ursula Le Guin’s fantasy novel “A Wizard of Earthsea”, (beware spoiler alert!) Ged the mage realises that the name of the malevolent entity which has been pursuing him is… Ged. It is part of his own personality, his own dark shadow; and by turning the hunter into the hunted, confronting it and calling it by its name, he is set free from its malign power. In Le Guin’s magic, naming is crucial as a symbol of deep recognition and understanding; her other key concept, balance, deals with right action in the light of this understanding. The incident from Ursula Le Guin’s tale of magery illustrates a point I want to make about “magic” in fiction: an author can describe it so that it is not only convincing within the narrative, but actually works. By that I mean that there can be psychological truth in the invented methodology and consequently in the outcome of the story. The characters involved can undergo recognisable personal development with which the reader can identify. I would argue that it is not enough simply for good to triumph over evil: we all know that to be a desirable outcome, but if that’s as far as it goes, the story is mere escapism. It’s rarely that simple in real life. Magic which “works” for fictional characters in this healing manner has much in common with modern re-inventions of “ancient” magic: for example the writings by Will Parfitt on psychosynthesis and Qabalah, or the “Earth Quest” series by R.J. Stewart both use patterns of archetypal symbols in a process of ritual story telling to foster personal development- should the reader be willing to engage with them as closely and imaginatively as the authors intend. The cynical may dismiss such books as New Age psychobabble, but this is to miss the important point which Jung made about archetypal symbols: they are not invented arbitrarily, but correspond to aspects of reality. If you haven’t come across Jungian archetypes before, the autobiographical “Memories, Dreams, Reflections,” which he was working on up to his death in 1961, is a fascinating introduction. One of the notable features of Le Guin’s novels is that in her invented world, Earthsea, there is no supernatural: magic is a feature of everyday life, and even the land of the dead is regarded as part of the available landscape and can be travelled. Belief in “the supernatural” is actually a comparatively recent phenomenon, arising, paradoxically enough, from the spread of secular materialism. In classical and mediaeval times the beings that we now think of as inhabiting a supernatural world (gods, spirits, heaven, hell, ghosts) were simply a part of the natural order. This is why the mortal Orpheus, for example, was able to descend into the underworld in search of Eurydice. Ironically, it was only by ceasing to believe in the reality of such phenomena that society as a whole was able to as it were kick them upstairs into the attic of the supernatural, there to be nurtured and (just about) kept alive by the superstitious, sentimental, or nostalgic. You might say this happened in parallel with the emergence of mathematical physics: Sir Isaac Newton’s naming and taming of nature was a kind of magic in the Le Guin sense. He was one of the last scientists to practise alchemy, seeing no conflict between what he was doing in his laboratory and in his oratory. I would argue that the supernatural developed as a concept in compensation for what was felt to have been lost when natural processes were explained scientifically, rather than being seen as the action of gods or spirit beings: and the ground was prepared for the pointless science versus religion arguments which bore school debating societies to this day. But flirting with the weirdness, fear, and lack of control which tales of the supernatural convey is, of course, attractive. We can shudder at M.R. James even though we know that ghosts are no more a part of reality than phlogiston. What is real is the emotion they call forth; and that’s a mark of good writing- if you like that sort of thing! Authors of fantasy novels have a number of options regarding the relationship between their invented world and that of the reader’s experience. Supernatural fantasy worlds are those which are quite distinct from everyday reality, and are accessed through a special portal, such as C.S. Lewis’s wardrobe or Carroll’s rabbit hole. Then there are those worlds which exist parallel to, but with direct influence on, the everyday: J.K. Rowling’s platform 9¾ or the police telephone box of Steven Moffat et al lead to a kind of supernatural reality, but one which is actually an extension of the everyday unknown to everyday people. Here, the reader is allowed to partake of secret knowledge: of Hogwarts, or the mysteries of the Tardis; or, one might add mischievously, of evangelical Christianity- Gnosticism is alive and well, and living in your local Intercollegiate Christian Union. Other fantasy worlds, like the worlds of classical myth, lack a supernatural in the strict sense I am using here: in Tolkien’s Middle-earth, as in Le Guin’s Earthsea, the existence of magic and non-human races is known to all and is a normal part of life: there is no supernatural because what would normally be considered supernatural is… natural. An extreme example of this might be the topography of Milton’s Paradise Lost, where angels drop in to converse with men, and Sin and Death work like navvies to construct a causeway across chaos. When you’re talking about magic in fiction, you don’t get far before someone mentions J.K. Rowling. Fantasy worlds which offer a secret supernatural extension to the everyday are very popular, certainly with children. I noticed this particularly when I was teaching English and used “The Wizard of Earthsea” as a class reader with groups of twelve-year-olds. They enjoyed having the story read to them, and were happy to discuss its magical elements; but in the end, it was always Hogwarts they chose to read for pleasure. Of course, this was due to Le Guin’s relative obscurity as an author as much as to her more developed, poetic style of writing; young Master Potter’s publicity machine had made reading about him (or at any rate, doggedly turning the many, many pages) de rigueur at the time. But it wasn’t just fashion or accessibility; the thing the children loved about reading Rowling (and C.S. Lewis, or Anthony Horowitz) was the sense they got of being an insider, of having secret knowledge beyond that available to the everyday (adult) world around them. A great deal of their creative writing reflected this: they would invent stories of new pupils arriving at school who seemed a little odd, but after being befriended by the narrator were ultimately revealed to be aliens, or to have some kind of Special Power. There’s a lot of wish fulfilment here. Who wouldn’t like to slip out of boring lessons into a colourfully different reality, or punish bullying classmates with a magical spell? As I suggested above, Gnosticism has a powerful appeal for some adults too; hence the many books offering to share “secret” knowledge- step forward, Dan Brown and the peddlers of conspiracy theory. Rowling’s books are entertaining and certainly turn a lot of children on to reading. This is a Good Thing, so please don’t accuse me of J.K. bashing! But for me, both as a general reader and as a teacher, her magic of wand-waving and potion-brewing doesn’t work in as meaningful a way as Le Guin’s. I like fantasy writing which, however wild imaginatively, is still rooted in reality; and Rowling’s is pure escapism. Both authors write about magical schools: Harry is at Hogwarts and Ged is at the Mage school on the Isle of Roke. A brief comparison shows that both have “good” and “bad” characters: Rowling’s sneering Draco Malfoy, for example, corresponds to the arrogant Jasper who provokes Ged to folly. So far, so Tom Brown’s schooldays. There are friendships and rivalries, and magical meals. The lessons at Hogwarts seem like anecdotal parodies of chemistry and biology; at Roke they are more like arts and crafts. Sport at Hogwarts is the exciting but pointless Quidditch; at Roke it is sailing, an integral part of managing wind and wave and moving in the world. Access to Hogwarts is by train and boat, a thrilling journey but essentially just one damn thing after another; Ged can’t even get into the school building until he’s solved a zen-like puzzle. The parallels go quite a long way, but it seems to me that Le Guin makes the reader think harder. Her Earthsea novels (“Wizard” is the first of a tetralogy) work on a structural level with certain key concepts which- correct me if I’m wrong- Rowling only mentions en passant if at all: the significance of names, and the importance of balance. So a lot of time at Roke is spent learning lists of names, and a lot of lessons are learned about mastery, not just of skills but of one’s own personality- which turns out to be the core of Ged’s task. Naming symbolises deep knowledge, but, to quote one of Ged’s teachers, “Power… must follow knowledge, and serve need. To light a candle is to cast a shadow…” and so the “Equilibrium” or balance of the world (physical and psychical) must be maintained. This is what a Le Guin mage sets out to do; and ultimately Ged is able to achieve a recognisable psychological goal by discovering the shadow’s name and restoring the balance of his mind. Taking a line through Shakespeare’s Prospero and Tippett’s chorus by way of Jung’s “Memories, Dreams and Reflections” the reader can engage with Ged’s journey of discovery as a poetic model of one that all of us must undergo. By comparison, what is Hogwarts actually for?